Identify the radio programs (such as the morning breakfast show) that you would like to record into Omny Studio. Locate a computer to act as the “recording computer” for each of your	chosen recording studios. The computer must be running Windows Server 2008 SP2 or later, or	Windows 7 or later. The computer must have a “line in” sound card jack to accept audio input	from the recording studio’s mixing panel. The computer itself does not need to be very powerful and the Recording Agent program will run in the background. Configure the recording studio’s mixing panel to create a bus that outputs	the microphones, sound beds (production effects), pre-recorded content(such as interviews or traffic reports) and phone caller audio into a singlestream. Do not include music or advertisements audio as part of this bus. Anything the recording agent hears from this output will appear in Omny	Studio. Select "Set up new Recording Agent" and give it a name. Install the Recording Agent software on the recording agent computer by	running the provided setup program file. When prompted, select the appropriate Production Feed line-in channel that you wish to record. Click on the Install button and then Close. Important: Be sure to only install each copy of the Recording Agent on the appropriate computer. Multiple installations of the same physical copy of the software is not supported, as each installation file contains a unique Recording Agent identifier. 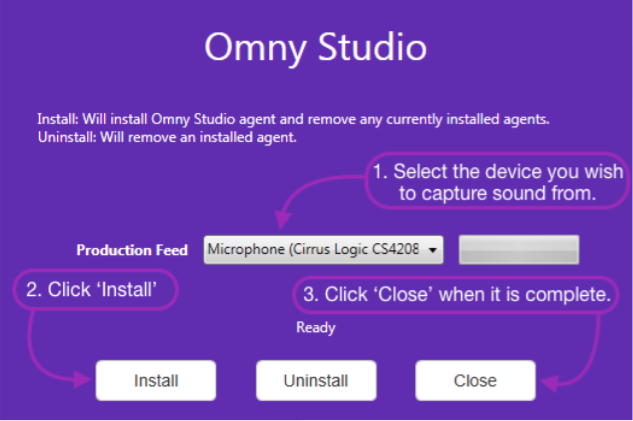 The recording agent is now installed and ready for use by the Omny Studio	platform. It is recommended to test the recording agent in action before	distributing logins to the wider team. If you have any problems with installation, please contact support@omnystudio.com.